It’s no secret that we travel a lot. It’s part of our job to meet with our artisan groups and make sure they have what they need to create the Meridian products we all love. When we’re on the road, it is just as important that we make time to relax and enjoy the local sites and sounds, too. Since we just got back from Guatemala, we thought we’d share some of our favorite spots from our trip. 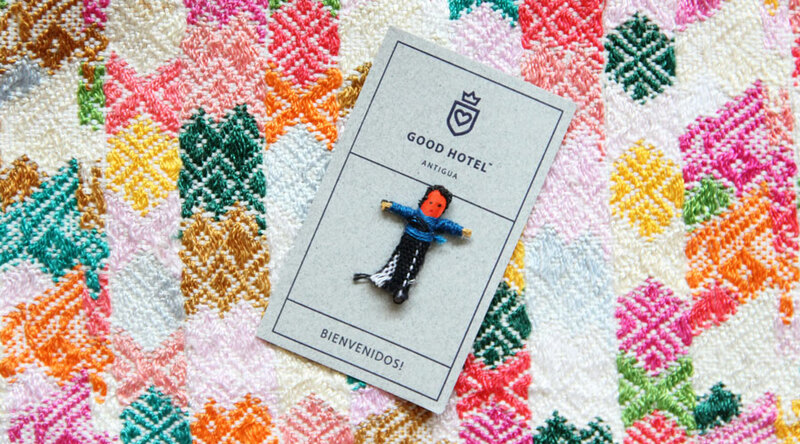 The Good Hotel is a hospitality company with a social mission. 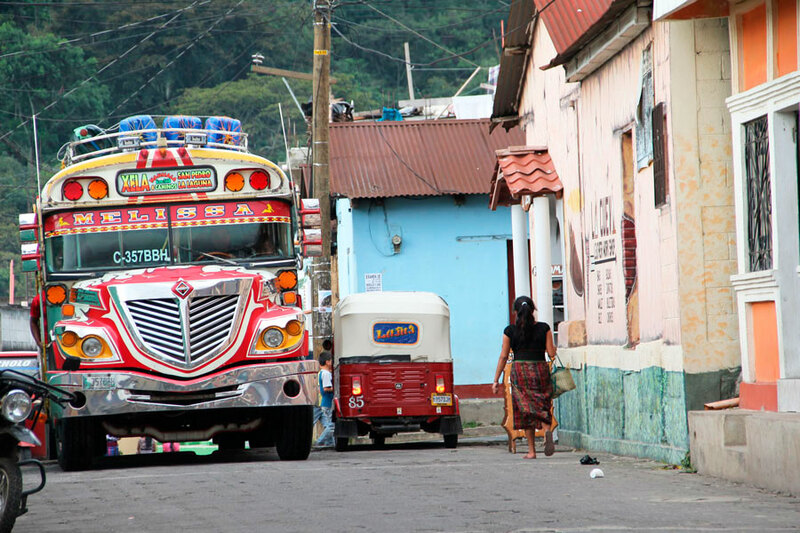 Our first stop was to Antigua, a colonial town situated in the central highlands, about an hour from Guatemala City. Antigua is full of eclectic restaurants, boutique shopping and gorgeous ruins. The Good Hotel was our headquarters during our visit, and it was more than good. The hotel is located away from the hustle of the main square on a charming cobblestone street. The decor is minimalist and cool, and all provided by local artisan groups. To top it all off, the Good Hotel is a hospitality company with a social mission, and they invest their profits in the education of disadvantaged local children. They were even sweet enough to give us worry dolls to keep under our pillows! We can’t say enough good things about the Good Hotel. Even if you’re just in Antigua for a few hours, it’s worth a stop here for the amazing coffee and modern design. Put these worry dolls under your pillow, and you’ll sleep well tonight. 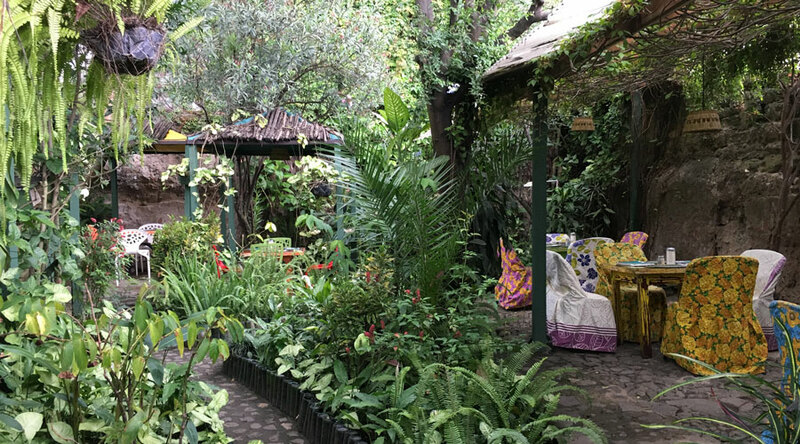 The secret garden at Sabe Rico in Antigua was our favorite lunch spot. One of our favorite lunch spots in Guatemala was so delicious we actually went there twice! (As you know from our previous travels, we are a hungry group!) Sabe Rico has a huge, tropical garden and an organic, locally sourced menu full of tasty sandwiches and salads. Our favorite dish was a portobello burger smothered in fresh avocado and grainy mustard. 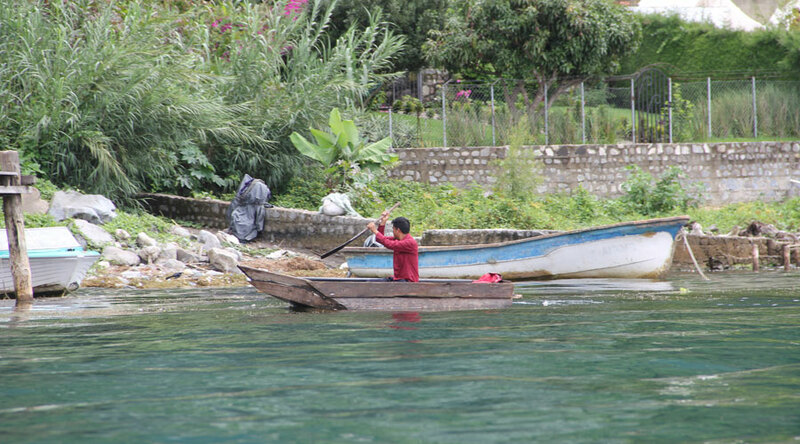 Boats are the main way of transportation between villages on Lake Atitlan. After a few days full of shopping, museum visits and wandering this small and charming city, we headed further into the highlands to Lake Atitlan. 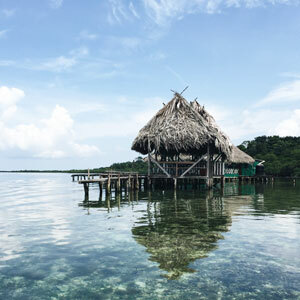 The large lake, which is flanked by volcanos and lush, green hills, is surrounded by small villages that are strongly rooted in Mayan culture and crafts. The most common way to travel around the lake is to stand on the docks outside your hotel or house and flag down a public boat passing by. A bit like hailing a cab in NYC, you patiently wait until a little blue boat speeds past and then frantically wave your arms in the air like you’re an air traffic controller. 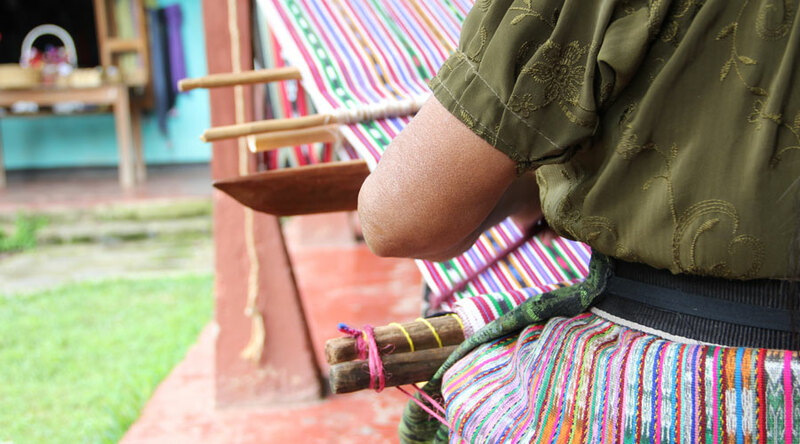 Each village around Lake Atitlan has a unique weaving style. We spent a few days in and around the Lake meeting with our artisan groups who live nearby. 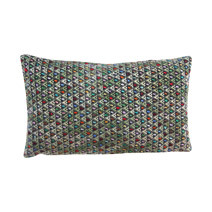 Each village has a particular specialty such as backstrap loom weaving, wood carving and leather work. We loved learning more about each village’s unique weaving styles, which are all distinctive in color choices and embroidery patterns. 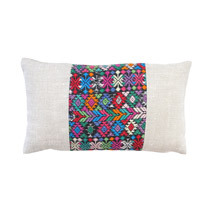 Needless to say, we fell in serious amor with Guatemalan textiles! We also snuck away to the bustling Chichicastenago market, which was a few hours’ drive from Lake Atitlan down long and windy roads. The twice-weekly Mercado at Chichicastenago has everything from fresh food and clothing to livestock. 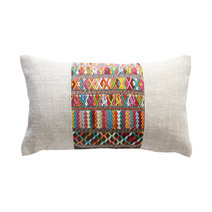 We’re no strangers to market shopping, but Chichicastenago was one for the record books! 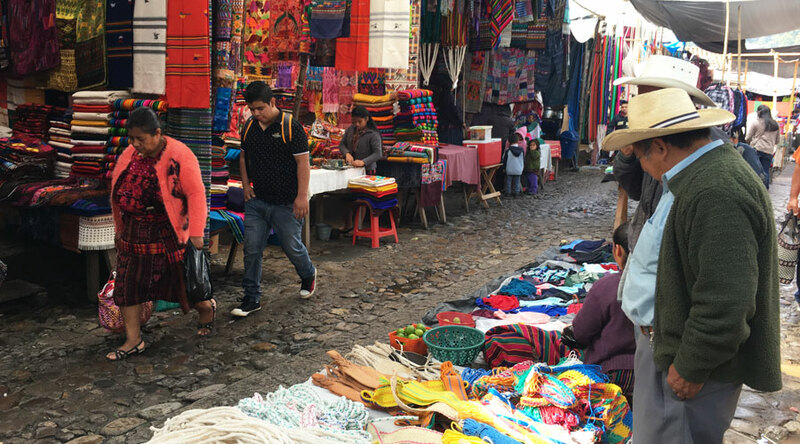 It was a labyrinth of aisles full of vibrant colors, the mouth-watering smell of tortillas on the open fire and market finds for the discovering. We picked up a few souvenirs and said hello to some old friends before making the long drive back to Antigua again for one more night in the alluring colonial town. 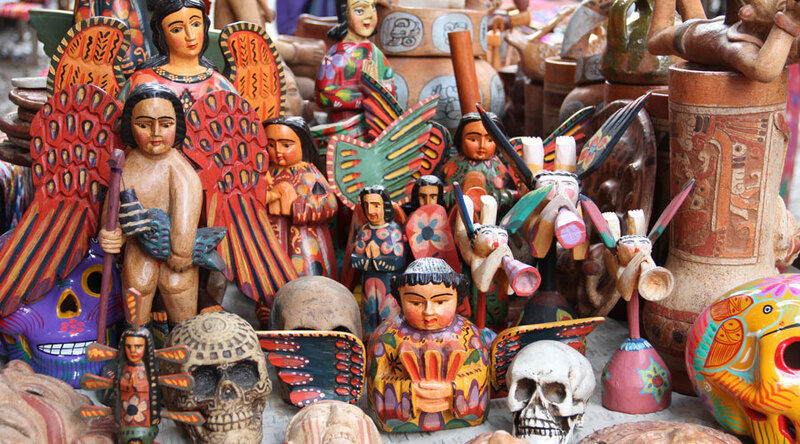 Intricate wood carvings were the star of the show at the market. 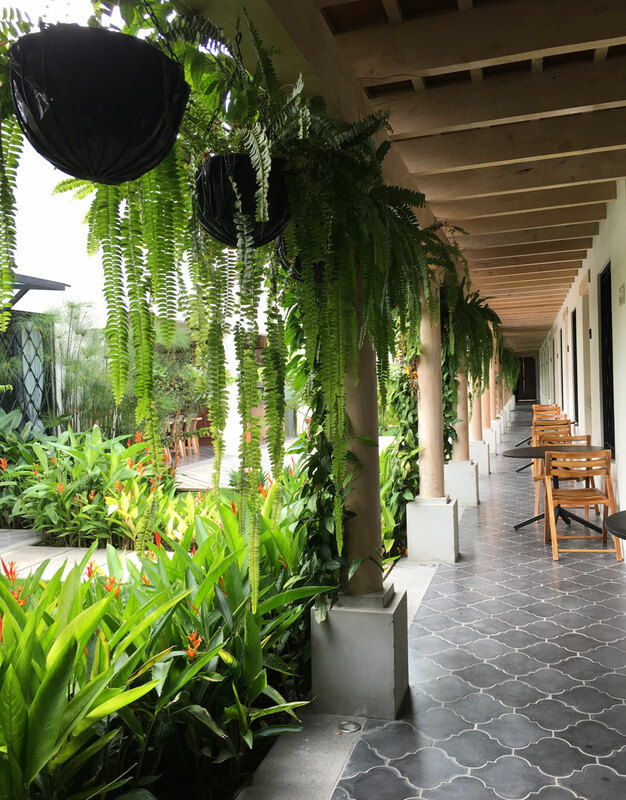 El Convento Boutique Hotel was a welcome and quiet spot after the bustle of the market. 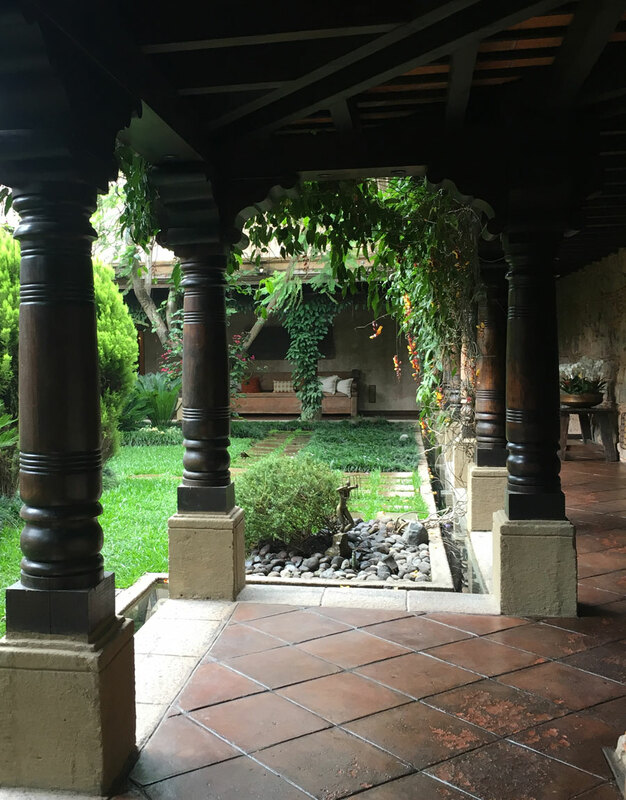 For our last night, we stayed at the luxurious El Convento Boutique Hotel in Antigua. A hidden compound that is nestled on a cobblestone street, El Convento showcases stunning architecture, 5-star service and generously sized rooms. It was a welcome and relaxing stopping point after the excitement of the Chichi Mercado earlier that day. Before we left, we were so thankful to have met up with Thread Caravan, who helped us plan the logistics of our Guatemalan adventure. 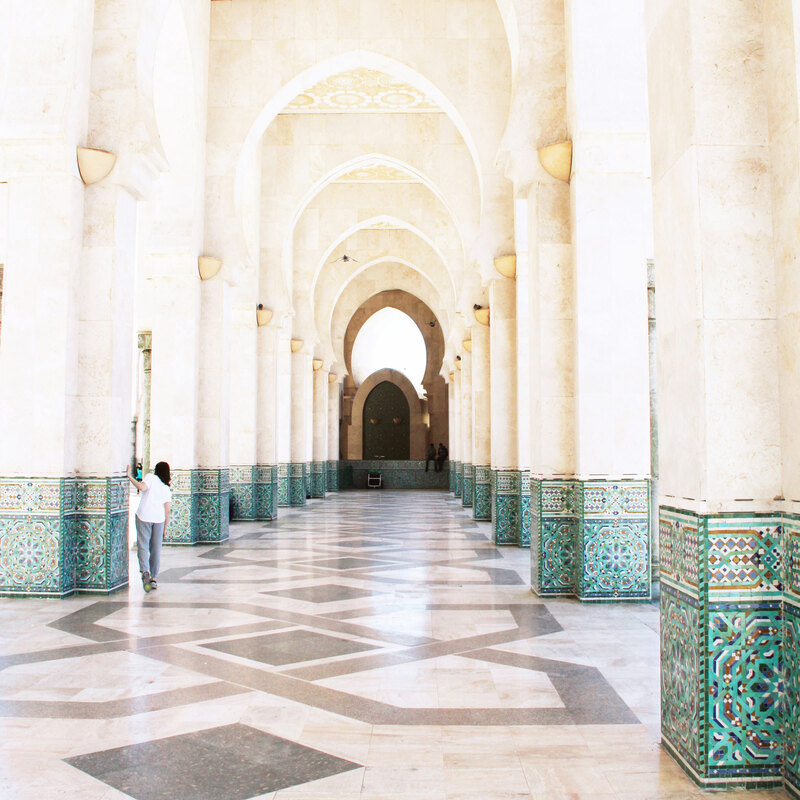 Caitlin and her team know the ins and outs of ethical travel, and, like Meridian, work with local artisan groups to celebrate the process of their creations. If you’re looking to plan a trip to Latin America, Thread Caravan sets up group tours and private travel full of interactive adventures like natural dying and mezcal tasting in Oaxaca or sailing and embroidery in Panama. We were so happy to have met them! Our trip to Guatemala this time was too short! We are sure to return soon and can’t wait to explore more of this beautiful country and its welcoming and friendly people. 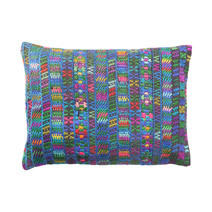 Do you have any favorite places in Guatemala? We would love to hear them!